ELECTRIC BASS GUITAR. MADE FROM THE VERY FINEST MATERIALS. NICKEL ROUND WOUND. HEAVY GAUGE. 50 - 105. Location: /BMG Magazine/BMG MAGAZINE: SUBSCRIPTION. The wise player never misses an issue of this instructive and interesting magazine for it is the best way of keeping up to date with the world of frets. 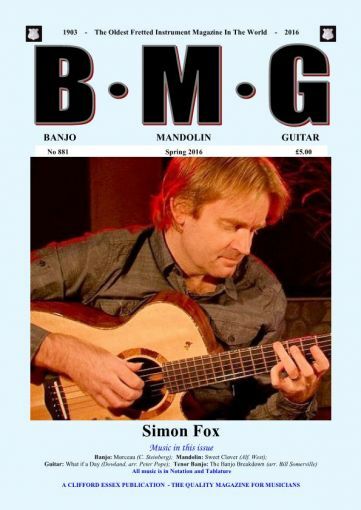 BMG is a quarterly publication issued in Spring, Summer, Autumn and Winter. The Spring issue is published during March, the Summer issue (shown) during June, the Autumn issue during September and the Winter issue during December. A twelve month subscription in the UK costs £23.00. Outside the UK the annual subscription is £25.00. Alternatively, you can subscribe for digital BMG for only £10.00 a year. For more information click here. DON'T MISS A.P. SHARPE'S 'THE BANJO STORY' CURRENTLY BEING SERIALISED IN BMG.